More than 1,320 mountain crew have been certified in First Aid and 69 porters and guides have been trained as First Aid Instructors and have gone on to conduct First Aid Certification courses for additional porters and mountain crew. Although the government has declared a minimum wage, the salary amounts paid are variable and can be as low as 8-10,000Tsh per day. Because it is mandatory for the Partner companies to pay at least 20,000Tsh per day, porters with Partner companies had an extra salary earning of at least US $500. Companies have different tipping procedures and climbers may give the guide the tip money assuming s/he will distribute the tip fairly. It is a Partner requirement to have transparency in tipping and KPAP reviews the tipping procedure on every climb. 98% of the Partner companies’ climbs had transparent tipping procedures. Porters may eat 1 or 2 meals per day on a climb. The Partner companies are committed to providing 3 meals per day. 315,000 more meals were provided to Partner companies’ porters above the norm. Porters may have poor sleeping accommodations and be overcrowded. Partner company porters slept in good quality tents and had adequate sleeping space 95.5% of the time. Partner companies weigh the bags prior to going to the gate. This helps ensure the appropriate number of porters and they are carrying the 20kg weight regulation. All legally licensed climbing companies are welcome to join the Partner for Responsible Travel Program. 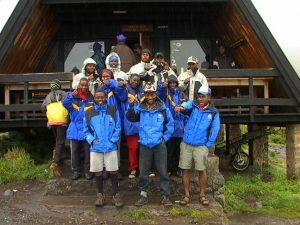 By choosing to climb with a Partner company, you can rest assured that your porters are taken care of well.